The beautiful part of that story is that Jesus laid down His life and willingly walked into the suffering because He knew that God was sovereign and He trusted that it would all turn out OK. He knew that just as the woman giving birth in the parable, his suffering would be over soon and would not compare to the joy that was coming, so He willingly went to the cross. There are dozens of Bible stories about other people who suffered for the sake of Christ: Abraham and Isaac, Job, Naomi, Paul, the list goes on and on. I have found that normally we try to find or offer comfort with words like, “this too shall pass”, “joy comes in the morning”, “all things work together for good.” But nothing ever stops the suffering or the hurt when we are going through it. Sometimes it hurts so much, we would do anything just for a moment of relief. Sometimes we try to find ways to stop the pain and the suffering, even with things that are obviously unhealthy, and occasionally we just try to avoid it by staying busy or doing anything just to keep our minds distracted. But what if instead of trying to get around pain or suffering, we did learn to walk right through it, willingly? I have been through suffering just like everyone else, I tend to be the girl who tries to avoid it with bad behaviors or staying busy. It is a difficult thing to accept suffering and pain, and a whole other level to choose to let ourselves feel it when it comes. 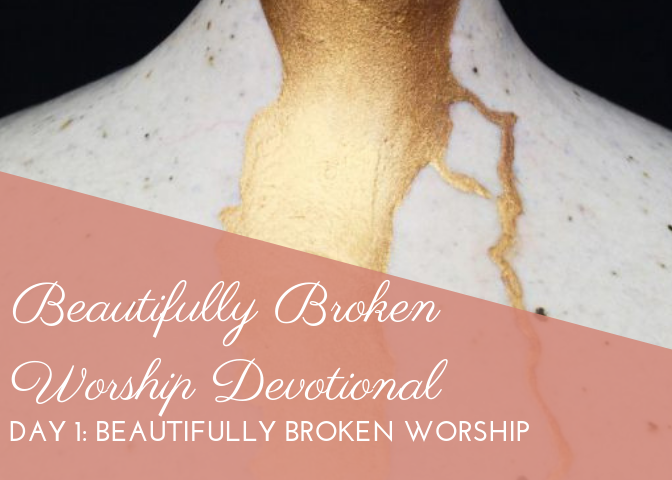 But God is teaching me that brokenness is beautiful and that He can heal and turn my brokenness into something more beautiful than I could ever imagine. Through some of my suffering, there have been moments, sometimes days, weeks, and even months that I didn’t even have the energy or mental or emotional capacity to even pray, much less read God’s Word, go to church, or do many of the other things we as Christians typically do to experience comfort or more of God’s presence in our lives. But in the midst of some of my worst suffering, I have found a simple way to invite the presence of the Holy Spirit into my brokenness and that is through music. Even when it has hurt too much to sing, it requires nothing of me to just listen. Time and time again, I have chosen to just listen to music and weep – sometimes on my face on the floor or driving in the car. I have found it to be a time that I allow myself to suffer and hurt and sob and yell and experience any emotion that comes when I otherwise would not. When it is Christian music or worship music, it becomes something that God uses to speak to me when I am hurting too much to hear His voice in other ways. In these moments, I have had some of the most powerful worship experiences of all. Over the next few days, I want to share some of these experiences with you. Each day, there will be Scripture to read, a thought from me, and music to go along with it. My only request of you is that you set aside about 15 minutes each day in which you have no distractions at all. Just 15 minutes of solitude to really immerse yourself in a few moments of Beautifully Broken Worship. You will need a pair of earphones or ear buds or a quiet place with speakers to be able to participate in the devotional this week. To start, listen to today’s song without any distractions. Bethany, this was so beautiful. There is “meaning” in all that we suffer. Thank you for helping me remember this important fact. Jesus suffered for all our sins and our suffering. Thanks again! Kimberly, I am so thankful that this was a blessing to you! It is a sweet reminder that pain has purpose, if we allow it to! Love you! And thank you for reading! I cannot tell you how many times God has spoken to me through music in a very powerful way. It is like you said, when those times of brokenness come in my life where it is hard to pray or i cannot find the words to express what is on my heart God is so real! He reveals himself in such a powerful way and it is one of the most wonderful, intimate times with our Lord. Thank you for sharing this message and for using your gift for God’s glory. Thank you for this. I needed the reminder badly. Nothing I’m going through is meaningless is a hopeful reminder in purpose. Thank you.